Welcome to my website. I’m so glad you’re here! Make yourself at home, look around, search for inspiration. And feel free to reach out with any questions. Work related or not. I’d be stoked to hear from you. Rodrigo is an amazing photographer! My husband and I could not have imagined our day without him! Everyone at our wedding spoke about how great he was! We received all of our photos back quickly and even received a few the morning after our wedding! We are in love with our wedding photos and could not recommend Rodrigo more! Rodrigo was an absolute dream to work with from start to finish. Rodrigo has a way of capturing the essence of who a person is through his photography. My husband is not big on taking pictures so it was really important that I found someone that can take beautifully “posed” family pictures but more importantly amazing candid shots. I explained to Rodrigo prior to the wedding this exact statement. He hit the nail on the head! He put my husband and our guests at ease. He has such a much needed calming presence in such a fun and chaotic day. He was great at directing everyone where to go and made sure to capture us and everyone at our wedding throughout the whole day. Beyond the beautiful candies he got, the scenery pictures and black and white photos he included were out of this world. 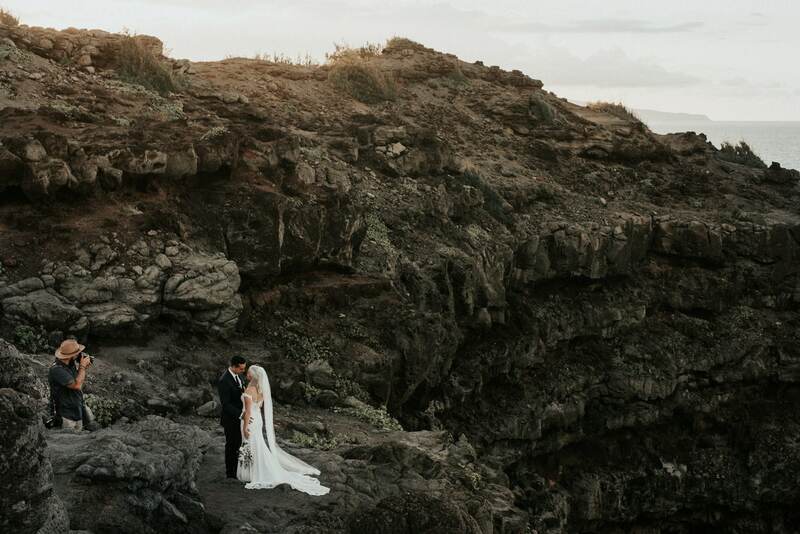 For many of our friends and family a destination wedding in Hawaii was not something that everyone could come to. Through Rodrigo’s photos and video, they felt like they were right there with us. Rodrigo is the most amazing photographer that you will find anywhere. I’m seriously obsessed with my video and photography. Thank you so much Rodrigo for everything and the memories that we will be able to share with our kids one day. You were the best photographer and made our day so special. Choosing Rodrigo as our wedding photographer was the best decision we made. Seriously. From the first look, to the ceremony, to small details, to tiny intimate moments, I’m amazed at how much was captured. Even better, with a small wedding of 28 people, we never felt there was a camera on us the entire time. Pure magic! We also had Rodrigo do our wedding video, the shots & music of that day go together perfectly in the video, and definitely brought some tears. We had so much fun watching it on our honeymoon and reminiscing. Rodrigo also took our engagement photos in Seattle, in the snow. It was great to meet him before the wedding, and the photos were equally as fun and special as our wedding day. We shot part at our home with our dogs, and part at park nearby. Rodrigo has a way of getting people who are less photogenic (me!) to be really natural in front of the camera, we were basically laughing the whole time and having fun. I love how candid the shots turned out, and we used the photos for our wedding guest book (they printed really well too). In addition to the quality of our photos & video, we couldn’t be happier with the experience overall. Rodrigo is awesome at communicating and answering questions, from day 1, to after the wedding, and we really made a friend through the process. All our wedding guests commented on how great Rodrigo and Noel (shooting video), were. Everyone who sees the photos is taken away by the style and feeling of them, how unique and nostalgic they are. I can’t wait to look back on these photos in 50 years, each one is like a perfectly captured memory. We could not be happier, our hearts are full every time we look at our photos and video. And such a great experience - Thank you Rodrigo! Rodrigo was the absolute best part of our wedding! I can't recommend him highly enough. Our experience with Rodrigo planning beforehand was so seamless and easy that I had no stress about him at all (and planned my wedding from CA without visiting!). He made everything so easy! We started our first pictures with him at our rehearsal dinner! I know this seems like an added expense but I can't tell you how amazing it was to have pictures from that intimate night with our closest family and friends. It also helped my husband and I get used to being in pictures, and it helped our wedding party get to know him as well. He is so easy going he even makes shy people and kids comfortable in front of the camera and catches those important moments that pass by too fast during the wedding festivities. The rehearsal dinner photos are such a treat to have I'm so glad I decided to have him there!! Now for the wedding day! He honestly couldn't have done anything different or better. He captured every fun moment, every happy tear, and every loving look that I will cherish forever. He made me feel pretty, and my husband calm, and when I got the photos back from him I just about died with happiness. They are so gorgeous!!! He was able to get our first look, wedding party, church ceremony, sushi cocktail hour, dinner, and drinks and dancing. He was fun, professional, easy going, and just an absolute perfect fit for our wedding. I actually got a lot of compliments from guests about him being a great photographer that they felt comfortable around. I can't recommend his services enough and am already scheming some excuse to get back to Maui to work with him! The wedding goes by so fast you don't realize how much is going on until you get all the photos back and you get to relive all those beautiful moments. Thank you Rodrigo!